ME Sound has been manufacturing Hi Quality Audio amplifier products since 1976. In October 2003 events led to the close down of normal operations. Since that time Service and advice have been provided where ever possible with the resources and time frames available to me to support and maintain the products manufactured during those 26 years. ME is rebuilding slowly and this site will report those efforts in the ME news section. This includes changes in aesthetics and where and how the products are assembled and tested. Pre Amplifier: Upgrades including both moving magnet and moving coil options as well as a variey of inputs are being currently designed. Other products may be added according to demand and success of the first releases. 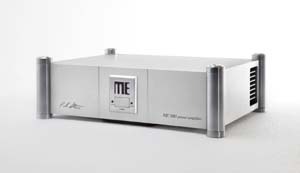 After a lengthy development process and numerous hurdles to jump, the new ME Power Amplifier is finally here. 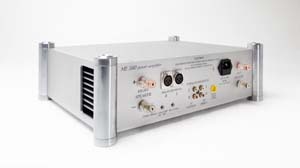 An Australian Designed and manufactured power amplifier. A new look to the traditional ME 550 Amplifier, with numerous colour and design options available, a truely personalised Amplifier to meet your own personal taste. The standard ME 580 will be offered in both Post and non Post versions and also via Rack Mount. The colour options can be found under the 580 Product Information, though the standard product available will be in Black with Chrome Logo and Posts (If Post Version Selected) and also Natural with Saturn Chrome Logo and Posts (If Post Version Selected) - As seen below. A truely impressive re-launch to a remarkable history in Power Amplifiers. Peter Stein the founder of ME set a daunting task to the developers at Winovate and to Ron Berger's credit in conjunction with input from Peter Stein and other names such as Charlie Van Dongen, we finally have a product that we are proud to add the ME name to.